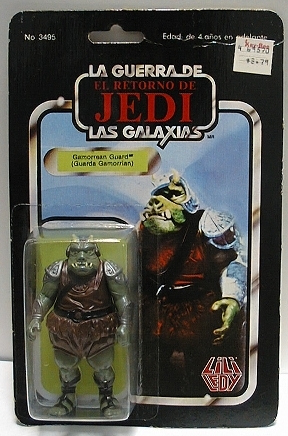 Released in the first wave of Lili Ledy El Retorno De Jedi figures, the Gamorrean Guard (or Guarda Gamorrian) has a card photo with different colors than its American counterpart. The character is a much lighter brown and green and his entire left arm can be seen (it is cropped in the Kenner release.) The figures itself usually has no significant variants. This piece was released primarily on the first Lili Ledy back, the Jedi 12 Back but was released on the subsequent updated 14 Back that showed the correct TIE Fighter and the addition of the two Ewoks in the figure line. Shortly afterwards the logo was changed from "El Retorno De Jedi" to "El Regreso Del Jedi" which stayed through the rest of the line.